There are vast numbers of people who love backpacking in the wilderness. But for the ones who love to travel lightweight, two things can really weigh you down. Food and water can be some of the most substantial things you are carrying in your backpack. These consumables will get lighter as your trek progresses, but when you look at the effort, people put into reducing their base weight of equipment and gear. It comes as a surprise there isn’t more effort put into reducing the weight of their consumables. 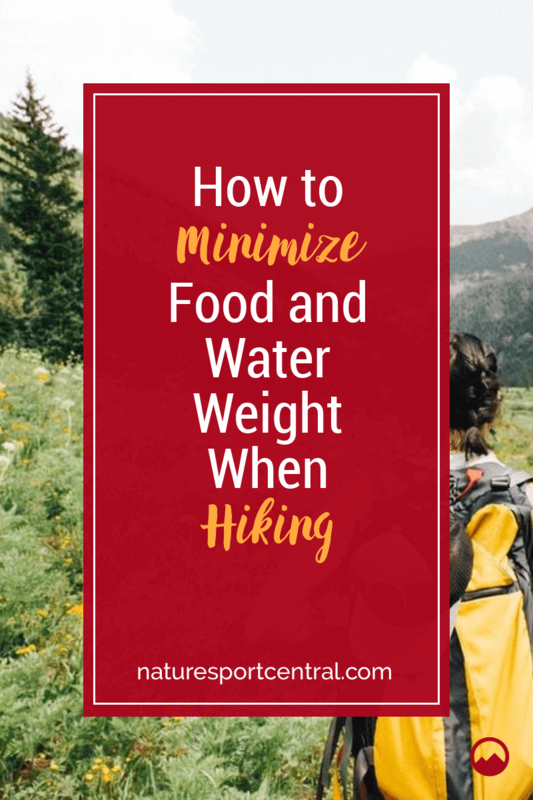 Here we will run through some of the best hiking food you can take to reduce the weight of food and water while hiking, but first, let’s just have a quick look how heavy some of these items can be. How Heavy are my Hiking Consumables? If you are trekking for a five day period, you can be carrying a minimum of almost 5 kilos of food. When you look at how much does a case of water weigh? Just half a gallon equates to 1.8kg. When you are setting off on your trek, this is almost an extra 7kg in your backpack you need to contend with carrying. Hikers need to consider all of their FSO (Full Skin Out Weight). This will include the base weight of your gear, the clothing you are wearing when you set off, and your consumable weights. Water is essential and does need to take priority over food, but as we can see that it weighs two pounds per litre, it is one area to really cut back when doing it correctly. There are four factors you can consider for minimizing the amount of weight you are carrying throughout your trek. Doing your homework: Once you know where you are hiking, you need to know where there are any points that water will be available. Knowing this, you can plan in advance and make these water locations close to where you will be staying. This homework should be done as part of your hiking essential list. Camel up in the morning and on the route: Before you set off in a morning, you should make a habit of drinking at least half a litre of water. The more you can drink at the start of the day, you will need to carry less, and you will be well hydrated. If your trekking path has limited water stops, at each of these you need to maintain your fluid levels, so at least one litre at each stop is advisable, and you are only carrying water packs for hiking you need to reach the next stop. Consider the timing: The times of day when you are hiking will have an effect on sweating. If you choose the cooler parts of the day, you will conserve fluids, and it will be less critical to carrying more. Cooking meals: There is a lot of water needed for cooking, so choosing feeding places which is in-between water stops is not advisable. You will add water to carry for little reason. With experience, you should be able to calculate the amount of water needed to get you to the next watering hole. The more you carry, the more energy you will be wasting over a long distance. The ideal foods are ones which are nutritious and are light to carry. This can limit what you can eat at meals, but it doesn’t mean you need to go without some tasty cooked dinners. The other advantage with most of these foods are, they deliver plenty of slow release energy that will power you through the day. Dense and High-Calorie Foods: These contain higher energy to weight ratio and are ideal for those midday snacks. Energy bars are high in carbs and fats and will maintain energy. These are a perfect complement after chewing on some beef jerky and then followed by a handful or two of dried fruit. These can make a great on the go lunch before setting up camp later in the day. Vegetable oils such as olive oil can help keep the energy up, and for meals which are a little bland, they can add some much-needed flavor. Low Moisture Foods: These are best used when cooking dinner, and there are many backpacking meals you can buy which only require water being added and heated. These freeze dried foods weight next to nothing, and take up very little space. Trail mix is food which requires no preparation, and you can add other fruits or nuts as you want to give you an extra flavor. Minimal Cooking Foods: The more foods you don’t need to cook, the lighter your backpack will be. Non-perishable food can be found which are also dehydrated and require minimal preparation time. One healthy option is breakfast cereals, and if you take powdered milk along, this can make a good substitute and deliver a healthy breakfast that will last you until lunchtime. Healthy backpacking food doesn’t all need to taste dry and lacking enjoyment when you eat it. With some planning, you can take foods which are delicious and highly nutritious that you can eat at any time of the day. Repacking Foods into Smaller Containers: There are plenty of foods you can purchase in small packs, although there are many which would be too large to carry. Choosing smaller backpacking food containers can make this much more manageable while allowing you to take tasty food along with you. Peanut butter delivers lots of energy and changing this from a large jar to a smaller container, and you can have a tasty snack with crackers that will give you a real boost. When you look at reducing the weight of your hiking food in the same way as saving weight on your gear, you can save around 30% compared to what a day trekker would take with them. If you total this up for a 5 day period as an example, you can save 3 – 4 kgs of food alone inside your backpack. Hiking food doesn’t need to be dull, and at the very least, it doesn’t need to slow you down.